In the ever-changing world of business, we all seem to want everything yesterday, and that goes for your clients as well. At Short Run Forms we strive for speed and consistent quality to meet your clients needs. We understand that being able to turnaround simple as well as complex jobs quicker leaves a positive and lasting impression on your clients. One area where Short Run Forms stands out is with our turnaround on Wraparound Books. Having an efficiently run office and shop is what allows us to turnaround these at ONLY 5-7 DAYS. They protect the forms within them from getting dirty and from elements when out in the field. Carry around a book of forms instead of them being loose and flimsy. Specifically positioned staples secure all forms in place. Perforations at top make tearing out forms easy. Added flyleafs can be tucked under the first form, so you will not transfer writing to the next form in the book. …plus you can choose various cover stocks. As a great value-added service, suggest to your client about adding some printing to the cover of their book job. 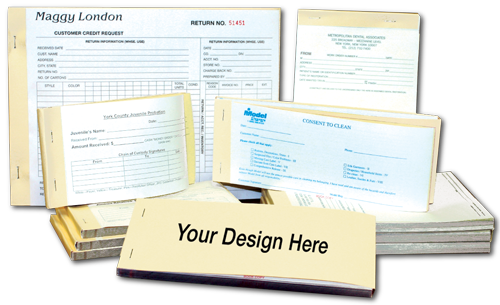 We can produce beautiful full color printing of anything from their branding to instructions for filling out their forms. It’s a great way to add some POP to your clients forms and help them STAND OUT from their competition.